Spotify and Hulu have linked up once again, this time offering customers in the US the chance to pay a single monthly subscription to enjoy both services. 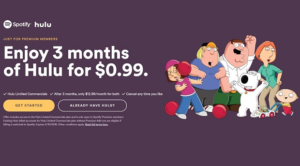 The $12.99-a-month subscription bundle combines Spotify Premium with Hulu’s Limited Commercials service giving subscribers access to ad-free music streaming and a video streaming library of over 75,000 TV shows and movies. The new deal follows on from the student plan introduced by the pair back in September 2017. With this joint subscription offering, undergraduate students enrolled in a US Title IV accredited college or university – who already have a Spotify Premium for Students subscription – can access both Premium and Limited Commercials for $4.99. For the time being, like with the student plan, the offer is only available to existing Spotify Premium subscribers. Those with existing Hulu Limited Commercials subscriptions are required to switch billing to Spotify in order to enjoy the offer. The two companies do, however, intend to open the bundle offer to people without Spotify Premium this summer.